You may notice some new posts have popped up here – when I got preggo I decided to set up a new blog to discuss non-food topics, as OMG had become firmly food-focussed. But recently I decided to incorporate Bake Make Rake in here for lots of reasons, but because I hate the tumblr CMS, really. Unfortunately none of the lovely comments came with the content during the import which makes me sad as some of them were very heartfelt, on rather personal, ranty posts. On that note, expect more about craft and kids here now. So, cupcakes. There’s an imminent first birthday in this household and I really want to try to make some fun things as my contribution to the joint spread (for Sproggett and two of his tiny cohorts). Now I know that I’ll have the Irish grandparents here in the run-up which is awesome as my Dad was a baker so should be able to offer some help (although he’s more the ‘crack six dozen eggs in five minutes, bake 288 loaves of bread type baker) but I did a practice run of something that’s simple and quick so I’ve at least one thing up my sleeve. Chop in half as many white buttons as you’ve got muffins or cupcakes, and twice as many chocolate ones. If you’re using a piping bag, fill it now and generously slather each mini muffin with frosting. You could also spoon it on and then rough it up with a fork to give it some texture. 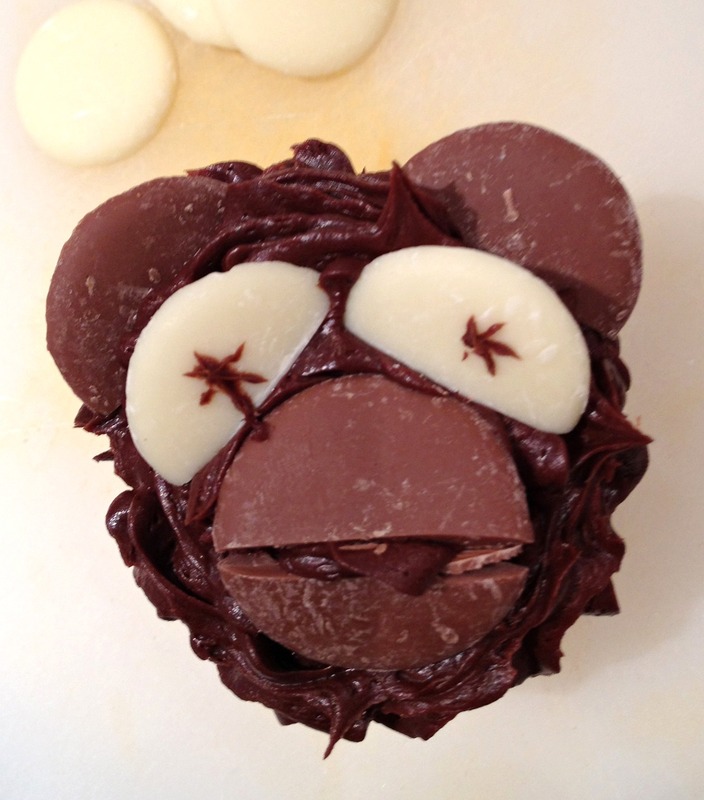 Place pairs of chocolate button halves as above to make the monkey face, then use either the piping bag or the tine of a fork to dot some frosting as eyes. Of course if you have time, make the mini muffins, and ganache, and sugarpaste decorations. I admit I am a little bit curious as to how they make frosting that apparently “stays fresh in the fridge for 30 days after opening”. Gulp. But mostly these days I’m just happy if I manage to leave the house in shoes rather than slippers and don’t forget the baby, so this might be my level of expertise for a while.